1. Click the School Directory button below for the address, phone, principal, school hours, map to school and a link to the school Web sites. Important: The results of your search do not reflect school rezoning changes approved during the current school year. Next year attendance zones become available after July 31st of each year. 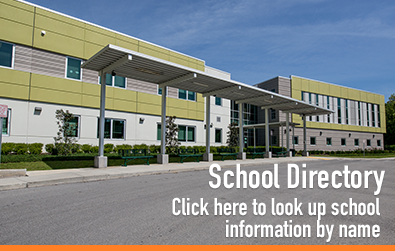 Please refer to the Enrollment, Rezoning & Transfers link on the left section to identify any rezoning initiatives during the current school year. School assignments in Orange County are determined by the address of the student’s parent or legal guardian. To determine the school assignments for a particular address, enter at least an address number and a partial street name (begins with portion). The Street Number or House Number is entered first (i.e. 923 W 15th St has a Street Number of 923, not 15 which is the Street Name). The Street Name may not include the Street Number, Street Direction, or Street Type (i.e. : Enter ‘Amelia’ if the address were ‘445 West Amelia Street’). The Street Type field may be left blank where it is not known or not applicable. Enter the City based upon the mailing address or leave it blank and pick the correct street from the list returned. The more complete an address you submit, the more definitive the search will be. Once the search is completed the column "Side" refers to Even (E) or Odd (O) House Numbers. The Student Enrollment Office is located at 6501 Magic Way, Bldg 100B, Orlando, FL 32809. Office hours are 7:30 a.m. - 4:30 p.m. Monday through Friday (except holidays). The phone number is 407.317.3233. This service is provided by Orange County Public Schools on an 'as is' basis. Neither Orange County Public Schools nor its partners, providers, or affiliates make any representations or warranties of any kind, express or implied, as to the operation of the service, its contents, or any information made available by or through the service. Orange County Public Schools disclaims all warranties, expressed or implied, including but not limited to the implied warranties of merchantability, fitness for a particular purpose, or any infringement. Furthermore, Orange County Public Schools does not warrant that use of the service will be uninterrupted, available at any time or from any location, secured, and error-free. Corrected defects are not warrantable and the service is not guaranteed free of viruses or other harmful components. 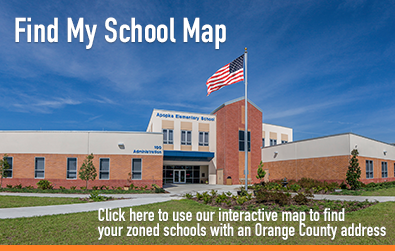 The school zoning address search is provided to allow easy access and visual display of school zoning information. Every reasonable effort has been made to assure the accuracy of the maps and data provided; nevertheless, some information may not be accurate. The burden of determining the accuracy, timeliness, completeness, merchantability, and fitness or appropriateness of use rests solely on you, the user.